International – MBA Part Time alumnus Alfredo Montilla shares his experience at EADA and the impact it had on his career. Alfredo currently works at McKinsey &Company as a strategic consultant. How would you define yourself personally and professionally? I’m always looking for new challenges and learning opportunities. Why did you decide to do an MBA? What were your goals? I graduated in computer engineering, and found, like many of my classmates at EADA, that my degree was very technical. I have always been interested in the business world, since the university years. Before I came to EADA, the idea of doing an MBA to complement my technical background was going around my mind for quite a while. Why did you choose EADA? What attracted you to the programme/school? 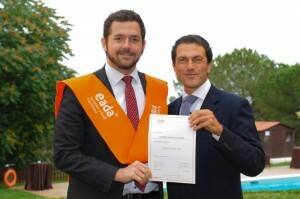 EADA met my main requirement of being a prestigious business school recognised on a national and European level. I also liked the international student body and the ideological independence of the school. I made my final decision after having EADA’s MBA recommended by several managers at my previous place of employment. Without a doubt, the personal development. The MBA opens your eyes and mind in a way that allows you to see opportunities that you could never have seen before. Of course, the professional development that you receive is also excellent, as expected in a school of this level. Do you have any specific story you would like to share? The MBA is a very intense year and a half of positive changes as well as a lot of pressure. Your classmates become part of your family. The “stories” that I take away from EADA are related to my weekends in the Residential Training Centre in Collbató. In Collbató, I had a great time with classmates, inside and outside of class. Can you explain a bit about your career before and after the MBA? When I started the programme, I was 27 years old and working as a CRM project manager in one of the biggest insurance companies in Spain. Now I am 29, and right after finishing the MBA, I had the opportunity to join McKinsey & Company as an associate consultant. Professional Development at EADA and for life!